The following work is a reprint of three articles which I wrote in 1872 for the Leipzig Volksstaat. Just at that time, the blessing of the French milliards was pouring over Germany: public debts were paid off, fortresses and barracks built, stocks of weapons and war material renewed; the available capital no less than the volume of money in circulation was suddenly enormously increased, and all this just at a time when Germany was entering the world arena not only a “united empire,” but also as a great industrial country. These milliards gave the new large-scale industry a powerful impetus, and above all they were responsible for the short period of prosperity, so rich in illusions, which followed on the war, and for the great crash which came immediately afterwards in 1873-74, through which Germany proved itself to be an industrial country capable of competing on the world market. The period in which an old civilized country makes such a transition from manufacture and small-scale production to large-scale industry, a transition which is, moreover, accelerated by such favorable circumstance, is also predominantly the period of “housing shortage.” On the one hand, masses of rural workers are suddenly drawn into the big towns, which develop into industrial centres; on the other hand, the building plan of these old towns does not any longer conform with the conditions of the new large-scale industry and the corresponding traffic; streets are widened and new ones cut through, and railways run through the centre of the town. At the very time when masses of workers are streaming into the towns, workers’ dwellings are pulled down on a large scale. Hence the sudden housing shortage for the workers and for the small traders and small businesses which depend for their custom on the workers. In the towns which grew up from the very beginning as industrial centres, this housing shortage is as good as unknown – for instance, Manchester, Leeds, Bradford, Barmen-Elberfeld. On the other hand, in London, Paris, Berlin, Vienna, the shortage took on acute forms at the time, for the most part, continued to exist in a chronic form. It was, therefore, just this acute housing shortage, this symptom of the industrial revolution taking place in Germany, which filled the press of the day with contributions on the “housing question,” and gave rise to all sorts of social quackery. A series of such articles even found their way into the Volksstaat. The anonymous author, who revealed himself later on as Dr. A. Mülberger of Wurttemburg, considered the opportunity a favorable one for enlightening the German workers, by means of this question, on the miraculous effects of Proudhon’s social panacea. When I expressed my astonishment to the editors at the acceptance of these peculiar articles, I was called upon to answer them, and this I did. (See Part One: How Proudhon Solves the Housing Question.) This series of articles was soon followed by a second series examining the philanthropic bourgeois view of the question, on the basis of a work by Dr. Emil Sax. (See Part Two: How the Bourgeoisie Solves the Housing Question.) After a long pause, Dr. Mülberger did me the honor of replying to my articles, and this compelled me to make a rejoinder. 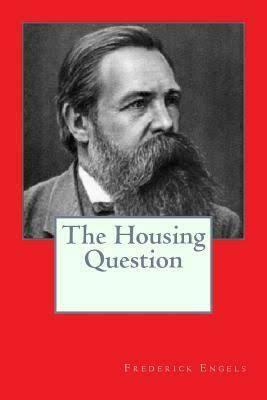 (Part Three: Supplement on Proudhon and the Housing Question.) With this, however, both the polemic and also my special occupation with this question came to an end. This is the history of the origin of these three series of articles, which have also appeared as a reprint in pamphlet form. The fact that a new reprint has now become necessary I owe undoubtedly to the benevolent solicitude of the German imperial government which, by prohibiting the work, as usual tremendously increased the sale, and I hereby take this opportunity of expressing my respectful thanks to it. I have revised the text for this new edition, inserted a few additions and notes, and I have corrected a small economic error in the first edition, as my opponent Dr. Mülberger unfortunately failed to discover it. During this revision, it was borne in one me what gigantic progress the international working class movement has made during the past 14 years. At that time, it was still a fact that “for 20 years the workers of the Latin countries had no other mental nourishment than the works of Proudhon,” and, at best, the still more one-sided version of Proudhonism presented by the father of “anarchism,” Bakunin, who regarded Proudhon as “notre maitre a nous tous,” the master of us all. Although the Proudhonists in France were only a small sect among the workers, they were still the only ones who had a definitely formulated programme and who were able in the Commune to take over the leadership on the economic field. In Belgium, Proudhonism reigned unchallenged among the Walloon workers, and in Spain and Italy, with isolated exceptions, everything in the working class movement which was not anarchist was definitely Proudhonist. And today? In France, Proudhon has been completely disposed of among the workers and retains supporters only among the radical bourgeois and petty bourgeois, who, as Proudhonists, also call themselves “socialists,” but against whom the most energetic fight is carried on by the socialist workers. In Belgium, the Flemish have ousted the Walloons from the leadership, deposed Proudhonism, and greatly raised the level of the movement. In Spain, as in Italy, the anarchist high tide of the ’70s has receded and swept away with it the remnants of Proudhonism. 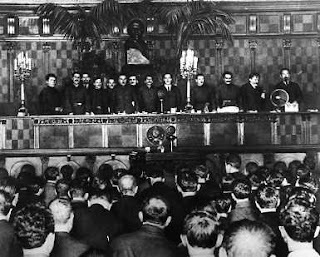 While in Italy, the new party is still in process of clarification and formation, in Spain the small nucleus, which as the Neuva Federacion Madrilena remained loyal to the General Council of the International, has developed into a strong party which – as can be seen from the republican press itself – is destroying the influence of the bourgeois republicans on the workers far more effectively than its noisy anarchist predecessors were ever able to do. Among most Latin workers, the forgotten works of Proudhon have been replaced by Capital, The Communist Manifesto, and a series of other works of the Marxist school, and the main demand of Marx – the seizure of all means of production in the name of society by the proletariat, which has attained the monopoly of political power – is now the demand of the whole revolutionary working class in the Latin countries also. If therefore Proudhonism has been finally supplanted among the workers of the Latin countries also, if it – in accordance with its real significance – only serves French, Spanish, Italian and Belgian bourgeois radicals as an expression of their bourgeois and petty-bourgeois desires, why bother about it today? Why combat anew a dead opponent by reprinting these articles? First of all, because these articles do not confine themselves to a mere polemic against Proudhon and his German representatives. As a consequence of the division of labour that existed between Marx and myself, it fell to me to present our opinions in the periodical press, that is to say, particularly in the fight against opposing views, in order that Marx should have time for the elaboration of his great basic work. Thus it became my task to present our views, for the most part in a polemical form, in opposition to other kinds of views. So also here. Parts One and Two contain not only a criticism of the Proudhonist conception of the question, but also a presentation of our own conception. Secondly, however, Proudhon played much too significant a role in the history of the European working class movement for him to fall into oblivion without more ado. Refuted theoretically and discarded practically, he still retains his historical interest. Whoever occupies himself in any detail with modern socialism must also acquaint himself with the “vanquished standpoints” of the movement. Marx’s Poverty of Philosophy appeared several years before Proudhon put forward his practical proposals for social reform. In this work Marx was able to do no more than discover and criticise the germ of Proudhon’s exchange bank. From this angle, therefore, this work of mine supplements, unfortunately imperfectly enough, Marx’s work. Marx would have accomplished all this much better and more convincingly. And finally, bourgeois and petty-bourgeois socialism is strongly represented in Germany down to this very hour; on the one hand by professorial socialists and philanthropists of all sorts with whom the wish to turn the workers into owners of their dwellings still plays a great role and against whom, therefore, my work is still appropriate; and on the other hand, in the Social-Democratic Party itself, and even in the ranks of the Reichstag fraction, a certain petty-bourgeois socialism finds a voice. This takes the form that while the fundamental views of modern socialism and the demand for the transformation of all the means of production into social property are recognised as justified, however, the realisation of this is declared possible only in the distant future, a future which for all practical purposes is quite out of sight. Thus, for the present time, one has to have recourse to mere social patchwork, and sympathy can be shown, according to circumstances, even with the most reactionary efforts for so-called “uplifting the working classes.” The existence of such a tendency is quite inevitable in Germany, the land of philistinism par excellence, particularly at a time when industrial development is violently and on a mass scale doing away with this old and deeply-rooted philistinism. The tendency is also quite harmless to the movement, in view of the wonderful common sense of our workers which has been demonstrated so magnificently during the last eight years of the struggle against the anti-socialist law, the police and the courts. But it is necessary that it should be clearly realised that such a tendency exists. And when later on this tendency takes on a firmer shape and more clearly defined contours, as it is necessary and even desirable that it should do, it will have to go back to its predecessors in order to formulate its programme and in doing so it will hardly be able to avoid Proudhon. The essence of both the big bourgeois and petty-bourgeois solutions of the “housing question” is that the worker should own his own dwelling. However, this is a point which has been shown in a very peculiar light by the industrial development of Germany during the past twenty years. In no other country do there exist so many wage workers who own not only their own dwellings but also a garden or field as well. Besides these workers there are numerous others who hold house and garden or field as tenants, with, in fact, fairly secure possession. Rural domestic industry carried on in conjunction with horticulture or small-scale agriculture forms the broad basis of Germany’s new large-scale industry. In the west the workers are for the most part the owners of their dwellings, and in the east they are chiefly tenants. We find this combination of domestic industry with horticulture and small-scale agriculture and therefore with secure possession of a dwelling not only wherever handweaving still fights against the mechanical loom: in the Lower Rhineland and in Westphalia, in the Saxon Erzgebirge and in Silesia, but also wherever domestic industry of any sort has established itself as a rural occupation: in the Thuringia Forest and in the Rhön. At the time of the debates on the tobacco monopoly, it was revealed to what extent cigar making was already being carried on as a rural domestic industry. Wherever any condition of distress occurs among the small peasants, as for instance a few years ago in the Eifel, the bourgeois press immediately raises an outcry for the introduction of a suitable domestic industry as the only remedy. And in fact both the growing state of want of the German small peasants and the general situation of German industry leads to a continual extension of rural domestic industry. This is a phenomenon peculiar to Germany. Only very exceptionally do we find a similar phenomenon in France, for instance in the regions of silk cultivation. In England, where there are no small peasants, rural domestic industry depends on the labour power of the wives and children of the agricultural labourers. Only in Ireland can we observe the rural domestic industry of garment making being carried on, as in Germany, by real peasant families. Naturally we do not speak here of Russia and other countries not represented on the industrial world market. Thus as regards industry there exists today a state of affairs over widespread areas in Germany which appears at first glance to resemble that which prevailed generally before the introduction of machinery. However, this is so only at first glance. The rural domestic industry of earlier times, combined with horticulture and agriculture, was, at least in the countries in which industry was developing, the basis of a tolerable and in some cases even comfortable material situation for the working class, but at the same time the basis of its intellectual and political nullity. The hand-made product and its cost determined the market price, and owing to the insignificantly small productivity of labour, compared with the present day, the market grew faster than the supply as a rule. This held good at about the middle of the last century for England, and partly for France, and particularly in the textile industry. In Germany, however, which was at that time only just recovering from the devastation of the Thirty Years War and working its way up under most unfavourable circumstances, the situation was quite different. The only domestic industry in Germany producing for the world market, linen weaving, was so burdened by taxes and feudal exactions that it did not raise the peasant weavers above the very low level of the rest of the peasantry. But, nevertheless, at that time the rural industrial worker enjoyed a certain security of existence. With the introduction of machinery all this was altered. Prices were now determined by the machine-made product, and the wage of the domestic industrial worker fell with this price. However, the worker had to accept it or look for other work, and he could not do that without becoming a proletarian, that is without giving up his little house garden and field, whether his own property or held by him as tenant. Only in the rarest cases was he ready to do this. And thus the horticulture and agriculture of the old rural hand weavers became the cause by virtue of which the struggle of the hand loom against the mechanical loom was so protracted and has not yet been fought to a conclusion in Germany. In this struggle it was shown for the first time, especially in England, that the same circumstance which formerly served as a basis for a comparatively comfortable material situation of the workers – the ownership by the worker of his means of production – had now become a hindrance and a misfortune for them. In industry the mechanical loom defeated the hand loom, and in agriculture large-scale methods (agriculture carried on in accordance with scientific principles and with technically perfected tools) drove small-scale cultivation from the field. However, while collective labour and the application of machinery and science became the social rule on both fields of production, the worker was chained to the antiquated method of individual production and hand labour by his little house, garden, field and hand loom. The possession of house and garden was now of much less advantage than the possession of complete freedom of movement. No factory worker would have changed places with the slowly but surely starving rural hand weaver. Germany appeared late on the world market. Our large-scale industry dates from the ’forties; it received its first impetus from the Revolution of 1848, and was able to develop fully only after the Revolutions of 1866 and 1870 had cleared at least the worst political obstacles out of its way. But to a large extent it found the world market already occupied. The articles of mass production were supplied by England and the elegant luxury articles by France. Germany could not beat the former in price or the latter in quality. For the moment, therefore, nothing else remained but, in accordance with the tendency of German production up to that time, to squeeze into the world market with articles which were too petty for the English and too shoddy for the French. Of course the popular German custom of cheating, by first sending good samples and afterwards inferior articles, soon met with sufficiently severe punishment on the world market and was pretty well abandoned. On the other hand, the competition of overproduction is gradually forcing even the respectable English along the downward path of quality deterioration and so has given an advantage to the Germans, who are unbeatable on this field. And thus we finally came to possess a large-scale industry and to play a role on the world market. But our large-scale industry works almost exclusively for the home market (with the exception of the iron industry which produces far beyond the limits of home demand), and our mass export consists of a tremendous number of small articles, for which large-scale industry provides at most the half-finished manufactures, which small articles, however, are supplied chiefly by rural domestic industry. And here is seen in all its glory the “blessing” of house- and land-ownership for the modern worker. Nowhere, hardly excepting even the Irish domestic industries, are such infamously low wages paid as in the German domestic industries. Competition permits the capitalist to deduct from the price of labour power that which the family earns from its own little garden or field; the workers are compelled to accept any piece wages offered to them, because otherwise they would get nothing at all, and they could not live from the products of their small-scale agriculture alone, and because, on the other hand, it is just this agriculture and landownership which chains them to the spot and prevents them from looking around for other employment. This is the basis which upholds Germany’s capacity to compete on the world market in a whole series of small articles. The whole capital profit is derived from a deduction from normal wages and the whole surplus value can be presented to the purchaser. That is the secret of the extraordinary cheapness of most of the German export articles. It is this circumstance more than any other which keeps the wages and the living conditions of the German workers on other industrial fields also below the level of the Western European countries. The dead weight of such prices for labour, kept traditionally far below the value of labour power, depresses the wages of the urban workers also, even of the workers in the big towns, below the value of labour power; and this is all the more the case because poorly-paid domestic industry has taken the place of the old handicrafts in the towns also, and here, too, depresses the general level of wages. Here we see clearly: that which at an earlier historical stage was the basis of relative well-being for the workers, namely, the combination of agriculture and industry, the ownership of house, garden and field, and security of tenure in the dwelling-place, is becoming today, under the rule of large-scale industry, not only the worst hindrance to the worker, but the greatest misfortune for the whole working class, the basis for an unexampled depression of wages below their normal level, and that not only for individual districts and branches of enterprise, but for the whole country. No wonder that the big bourgeoisie and petty bourgeoisie who live and grow rich from these abnormal deductions from wages are enthusiastic over rural industry and the workers owning their own houses, and that they regard the introduction of new domestic industries as the sole remedy for all rural distress. That is one side of the matter, but it also has its reverse side. Domestic industry has become the broad basis of the German export trade and therefore of the whole of large-scale industry. It is thus spread over wide areas of Germany and is extending still further daily. The ruin of the small peasant, inevitable from the time when his industrial domestic production for his own use was destroyed by the cheap, hand-made and machine product, and his cattle breeding, and thus his manure production also, was destroyed by the dissolution of the old Mark system, the abolition of the common Mark and of compulsory land tillage – this ruin forcibly drives the small peasant, fallen victim to the usurer, into the arms of modern domestic industry. Like the ground rent of the landlord in Ireland, the interest of the mortgage usurer in Germany cannot be paid from the yield of the soil, but only from the wages of the industrial peasant. However, with the expansion of domestic industry, one peasant area after the other is being drawn into the present-day industrial movement. It is this revolutionisation of the rural areas by domestic industry which spreads the industrial revolution in Germany over a far wider territory than is the case in England and France; it is the comparatively low level of our industry which makes its extension in area all the more necessary. This explains why in Germany, in contrast to England and France, the revolutionary working class movement has spread so tremendously over the greater part of the country instead of being confined exclusively to the urban centres. And this further explains the steady, certain and irresistible progress of the movement. It is perfectly clear that in Germany a victorious rising in the capital and in the other big towns will be possible only when the majority of the smaller towns and a great part of the rural areas have become ripe for the change. Given anything like normal development, we shall never be in a position to win working class victories like those of the Parisians in 1848 and 1871, but for the same reason we shall not suffer defeats of the revolutionary capital by the reactionary provinces as Paris suffered them in both cases. In France, the movement always originated in the capital; in Germany, it originated in the areas of big industry, of manufacture and of domestic industry; the capital was conquered only later. Therefore, perhaps, in the future also the initiative will continue to rest with the French but the decision can be fought out only in Germany. However, this rural domestic industry and manufacture, which in its expansion has become the decisive branch of German production and thus revolutionises more and more the German peasantry, is itself only the preliminary stage of a far-reaching revolution. As Marx has already proved (Capital, Vol. I, page 514, et seq. ), at a certain stage of development the hour of its downfall owing to machinery and factory production will sound for it also. And this hour would appear to be at hand. But in Germany the destruction of rural domestic industry and manufacture by machinery and factory production means the destruction of the livelihood of millions of rural producers, the expropriation of almost half the German small peasantry; the transformation not only of domestic industry into factory production, but also of peasant agriculture into large-scale capitalist agriculture, of small landed property into big estates – an industrial and agricultural revolution in favour of capital and big landownership at the cost of the peasants. Should it be Germany’s fate also to undergo this transformation while still under the old social conditions then it will unquestionably be the turning point. If the working, class of no other country has taken the initiative by that time, then Germany will certainly strike first, and the peasant sons of the “glorious army” will bravely assist. And with this the bourgeois and petty-bourgeois utopia which would give each worker the ownership of his own dwelling, and thus chain him in semi-feudal fashion to his own particular capitalist, takes on a very different complexion. Its realisation is seen to be the transformation of all the small rural house owners into industrial domestic workers; the destruction of the old isolation and with it the destruction of the political insignificance of the small peasants who would be dragged into the “social whirlpool”; the extension of the industrial revolution over the rural areas and thus the transformation of the most stable and conservative class of the population into a revolutionary hotbed; and, as the culmination of the whole process, the expropriation by machinery of the peasants engaged in home industry, driving them forcibly into insurrection. We can readily allow the bourgeois-socialist philanthropists the private enjoyment of their ideal so long as they continue in their public function as capitalists to realise it in this inverted fashion to the benefit of the social revolution.